Chronic obstructive pulmonary disease (COPD) is a major cause of chronic morbidity and mortality throughout the world, and the prevalence and mortality of this disease are predicted to increase in future decades. A unified, international effort is required to reverse these trends. For educational purposes, the Global Initiative for Chronic Obstructive Lung Disease, a classification of disease severity into four stages, is recommended: GOLD I, mild; GOLD II, moderate; GOLD III, severe; GOLD IV, very severe. Oxidative stress has been implicated in the pathogenesis and progression of COPD . Reactive oxygen species (ROS) from inhaled cigarette smoke or those endogenously formed by inflammatory cells constitute an increased intrapulmonary oxidant burden. Data from in vitro experiments and in vivo studies indicate that two general effects of oxidative stress are relevant to COPD. Oxidative stress causes structural changes to essential components of the lung, contributing to irreversible damage to both the parenchyma and the airway wall . ROS are generated by leukocytes in the blood or air spaces, or inhaled in the form of environmental pollutants including cigarette smoke , particulate matter, and wood smoke. ROS are scavenged by enzymatic and non-enzymatic antioxidants. Oxidant/antioxidant imbalance resulting from the increased production of ROS leads to biomolecular damage by the direct attack of ROS during oxidative stress. Consequences of oxidative stress include adaptation of the cell or organism by up-regulation of defence systems including induction of antioxidant enzymes to provide limited protection against oxidative damage . Additional consequences include cell injury involving oxidative damage to molecular targets including lipids, DNA, proteins, and carbohydrates. Oxidative damage can also occur during adaptation, but not all injuries caused by oxidative stress are oxidative. Damage to biomolecules can induce structural modifications; these are frequently observed in proteins . Such modifications can be accompanied by a decrease in the protein’s biological activity or receptor recognition and can result in changes in ion levels (e.g., Ca2+) or activation of proteases. Thus, the cell may (i) recover from oxidative damage by repairing or replacing the damaged molecules, (ii) survive with persistent oxidative damage, or (iii) undergo cell death by apoptosis or necrosis, particularly if there is oxidative damage to DNA. Chronic oxidative stress occurs during the progression of COPD. This is due in part to the continuous generation of ROS by neutrophils that are activated as a consequence of the chronic inflammatory process. This condition is aggravated by intermittent activation from other causes including cigarette smoke , air pollution, and deficient antioxidant mechanisms in certain patients. We measured the biomarkers of oxidative injury (see below) and C-reactive protein (CRP), a marker of systemic inflammation, in the plasma of COPD patients. The obtained values were related to forced expiratory volume in one second (FEV1), forced vital capacity (FVC), and the (GOLD) stage, which is a prognostic indicator of mortality risk according to the Global Initiative for Chronic Lung Disease . Relationships between the inflammatory process, oxidative stress, and the progressive decrease of lung function were investigated. Biomarkers of ROS in the plasma can potentially be used to evaluate both the injury and degradation of circulating biomolecules and endothelial cell membranes. These biomarkers can not only determine the extent of oxidative injury, but also identify the source of the oxidant and the chemical nature of the damage to biomolecules (lipids, proteins, carbohydrates etc. ), including modifications and breakage. The amount of biomarkers in the plasma depends on the number of susceptible substrates for ROS, including hormones and lipoproteins that induce lipoperoxidative and chemical modifications, especially in phospholipids and proteins. Stimulated neutrophils generate superoxide and its dismutation product, hydrogen peroxide, and release myeloperoxidase (MPO) . Myeloperoxidase, in addition to oxidizing classical peroxidase substrates to radical intermediates, has the unique property of converting chloride to hypochlorous acid (HOCl) , which is considered to be the most powerful oxidant generated by neutrophils in association with endothelial dysfunction. The results obtained from this study indicate that the progression of COPD (GOLD stage) correlates with an increase in protein carbonylation, the amount of susceptible lipoperoxidation of plasma substrates (SLPS) for lipoperoxidation in vitro induced by a metal ion-catalyzed reaction, total leukocytes, neutrophil count, and CRP levels. On the contrary, the levels of thiobarbiturate-reactive substances (TBARs), including MDA, 4HNE, and acrolein, do not correlate with COPD, due in part to the interaction between the end products of lipoperoxidation with proteins contributing to increased protein carbonylation. Seventy-two patients with COPD who fulfilled the criteria of the Global Initiative for Chronic Obstructive Pulmonary Disease  were recruited from our respiratory emergency service after acute exacerbation. The patients were stabilized and hospitalized for treatment with methylprednisone, oxygenation, and antibiotics according to the GOLD guide. After eight days of hospitalization with treatment, the sample of blood for the study was taken on the day before the patients were discharged. The patients were classified as moderate (II), severe (III), or very severe (IV) as evaluated by airflow limitation. The control group was composed of 14 healthy non-smoking volunteers who had a negative history of allergies (i.e., negative responses to skin prick tests for common allergens), normal spirometry results, normal FEV1/FVC ratios, no history of any disease, and were not receiving medical treatment for any reason. All subjects gave informed, written consent, and the protocol was approved by the ethics committee of the institute (C-03-04). Blood samples (5 mL) from both healthy volunteers and COPD patients were obtained by venipuncture and centrifuged. The plasma was utilized for assays of biomarkers. Myeloperoxidase activity was evaluated by oxidation of tetramethylbenzidine; the absorbance was measured at 655nm . To evaluate lipoperoxidation, 1,1,3,3-tetramethoxypropane (Sigma-Aldrich, MO) was used as a standard. Aliquots of plasma were used to measure thiobarbituric-reactive substances (TBARs) at 532 nm, and the obtained values were expressed as pmoles of malondialdehyde (MDA) per mg of dry weight . Protein damage was evaluated by determining free carbonyl levels  with protein determination used as the reference parameter . Plasma susceptible lipoperoxidation of plasma substrates (SLPS) in vitro is a technique used to measure the lipoperoxidation of aldehydes in an aliquot of plasma by metal ion-catalyzed oxidation. This method is conducive to ROS generation with the concomitant oxidation of substrates, especially unsaturated fatty acids in lipids and proteins. The lipoperoxidation end products arise from the presence of unsaturated fatty acids, mainly circulating as phospholipids. For SLPS quantification , five µL of plasma were mixed with 5mM H2O2, 5mM FeCl2 (for hydroxyl radical generation), and 950 µL Trizma-Preset buffer, 7.2 mM, pH 8.0, to a final volume of 1.0 ml. The mixture was incubated for 15 min at 37°C. The reaction was stopped by adding 1 mL 0.375% thiobarbithuric acid (TBA) in 0.2 N HCl and heating in a steam bath for 15 min. Finally, 0.5 mL of 0.2 N HCl was added. The tubes were cooled and the absorbance was measured at 532 nm (malondialdehyde, MDA). 1,1,3,3-tetrametoxipropano (Sigma Aldrich, MO) was used as the standard. Aliquots of plasma were simultaneously utilized for clinical chemical determinations including automated white blood cell and differential counts (CELL-DYN 3700 Abbott Laboratories. Illinois-USA). C reactive protein (CRP) levels were measured by nephelometry. Data are expressed as the mean ± standard deviation. One-way ANOVA and Bonferroni's multiple comparison test, linear regression, and Pearson correlation were used for statistical analysis. Differences were considered significant for p < 0.05. Data analyses were performed using the Statistical Package for Social Sciences (version 10.0 for Windows; SPSS Inc., Chicago, Ill). The general and clinical characteristics of the healthy volunteers (HV) and COPD patients are shown in Table 1. † Forced expiratory volume in one second. The total and differential leukocyte counts are shown in Fig. (1a, 1b). There was a highly significant increase (p < 0.0001) in both total and neutrophil leukocyte number associated with each stage of COPD, in accordance with the GOLD classification. The number of neutrophils (Fig. 1b; 3,738 ± 685 neutrophils/mL) and total leukocytes (Fig. 1a; 6,883 ± 657 cells/mL) was significantly lower (p < 0.01) in GOLD II patients than in GOLD IV patients (Fig. 1a: 10,050 ± 804 cell/mL and Fig. 1b: 7,350 ± 745). 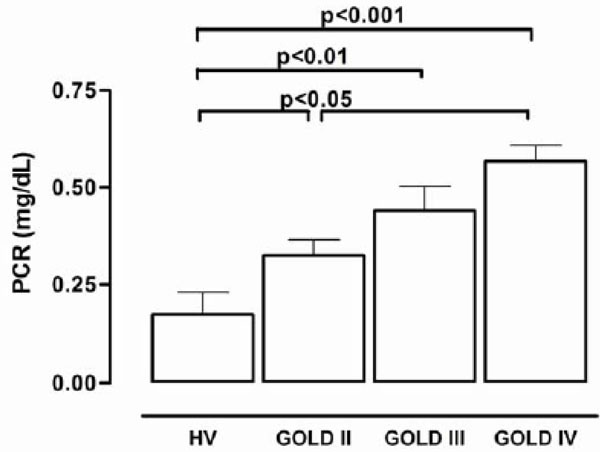 The differences were also significant when healthy volunteers were compared with GOLD IV patients (p < 0.001). 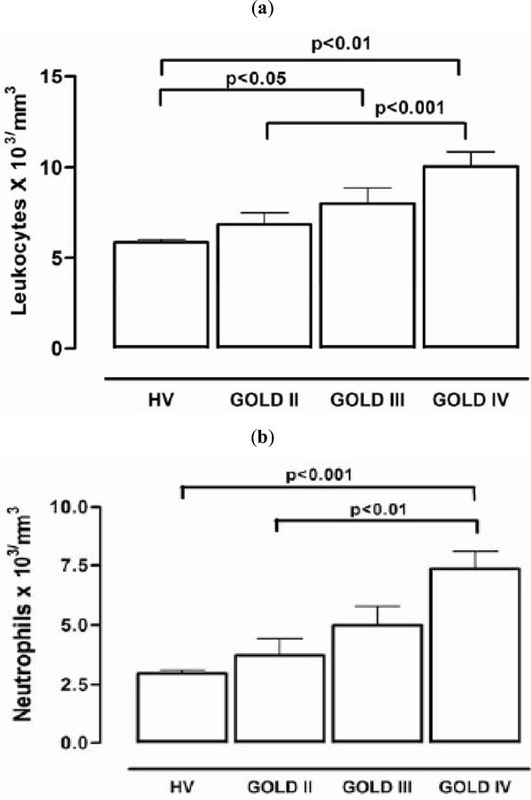 Leukocytosis in GOLD IV patients (10,050 ± 804 cells/mL) was increased by 1.7-fold, and the neutrophilia (7,350 ± 745 cell/mL) was increased by 2.4-fold when compared to healthy volunteers. The leukocyte counts in GOLD IV patients were significantly higher than in GOLD II patients. The plasma concentrations of expressed lipoperoxidation products (pmoles MDA/mg dry weight) were measured at each GOLD stage. Plasma MDA values for groups HV, II, III and IV were 0.1406 ± 0.01452, 0.1613 ± 0.01334, 0.1148 ± 0.00867 and, 0.1049 ± 0.00486, respectively, and the MPO values were 74.52 ± 15.61, 58.91 ± 5.926, 48.90 ± 7.861, and 49.17 ± 5.844, respectively. Since the MDA and MPO values did not correlate with disease progression, these data are not shown in the figures. Inflammation markers (a) The number of leukocytes (b) The number of neutrophils. The plasma concentrations of C-reactive protein. 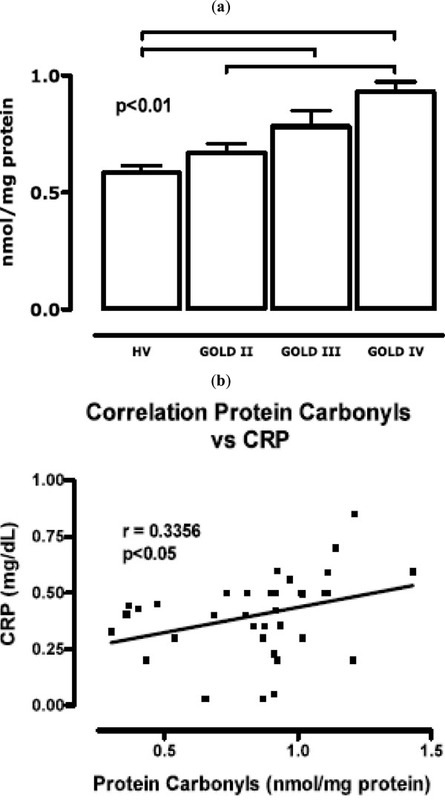 (a) concentration of free carbonyls measured at each of the GOLD stages (b) correlation between the protein carbonyl concentration and C-reactive protein level. Susceptible lipoperoxidation of plasma substrates (SLPS). Fig. (2) shows the plasma concentrations of C-reactive protein (mg/dl). 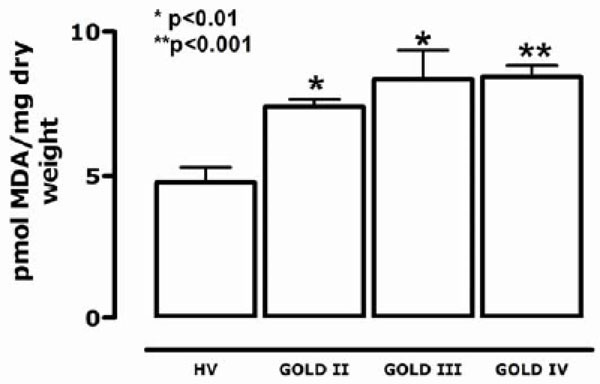 The values for GOLD II, III and IV stages were significantly greater than those in healthy volunteers. There was a significant increase in the C-reactive protein concentration in GOLD III patients when compared to healthy volunteers (0.44 ± 0.06 versus 0.17 ± 0.04 mg/dl). Fig. (3) shows that the concentration of free carbonyls in proteins was higher in COPD patients at all stages than in healthy volunteers (p < 0.001). The values in GOLD II patients (0.67 ± 0.03 nmol/mg protein) were 73% lower than those in GOLD IV patients (0.92 ± 0.04 nmol/mg protein). Fig. (3b) shows a significant correlation between the carbonyl concentration and CRP; the correlation coefficient was 0.3356 (p < 0.05). Plasma lipidic substrates (SLPS), mainly phospholipids that induce metal ion-catalyzed lipoperoxidation in vitro, can be used to measure of the amount of MDA produced. Fig. (4) shows that the SLPS level is dependent on the concentration of available oxidant substrates. The amount of MDA generated from an aliquot of plasma was significantly higher for patients in all stages of GOLD when compared to the control group (p < 0.0001). Values in GOLD II patients (0.01136 ± 0.00159 pmol MDA/mg dry weight) were 79.4% lower than in patients in the GOLD IV stage (0.01413 ± 0.0001 pmol MDA/mg dry weight). According to the definition of the American Thoracic Society, COPD is characterized by reduced maximum expiratory flow and slowed forced emptying of the lungs due to various combinations of airway disease and emphysema . This definition, as well as those published by many other societies and organizations , focuses exclusively on the lungs. Thus, it is not surprising that only pulmonary variables such as forced expiratory volume in one second (FEV1) or arterial oxygen tension (PaO2), have been considered in the evaluation and prognosis of this disease and that current therapeutic approaches almost exclusively target the lungs [1, 14, 15]. The focus on lung prognostics and therapy is beginning to change because several recent studies have indicated that COPD is often associated with significant extrapulmonary abnormalities, the so-called “systemic effects of COPD”. There is an increasing realization that these systemic effects are clinically relevant and may contribute to a better understanding and management of the disease. Skeletal muscle dysfunction (SMD), considered a major systemic effect of COPD, contributes significantly to exercise limitation in these patients . The identification of weight loss and SMD as systemic effects of COPD have drawn attention to the importance of nutritional support with vitamins and meals rich in antioxidants, often combined with exercise programs, to improve the quality of life and prognosis of these patients . The results of the present study are consistent with several recent reports that have associated COPD not only with an abnormal inflammatory response of the lung parenchyma , but also with systemic inflammation including systemic oxidative stress, activation of circulating inflammatory cells, and increased levels of proinflammatory cytokines . The systemic inflammatory response, measured as the number of leukocytes and differential leukocyte count, increased significantly with the stage of COPD progression (Fig. 1). Patients in GOLD IV had higher counts of circulating inflammatory cells than healthy controls or GOLD II or III patients. Carbonyl concentrations were correlated with the CRP concentration (Fig. 3b), which was also highest in patients in stage IV of the disease. The systematic increase of CRP is considered to be a representative biomarker for chronic inflammation. COPD progression is directly associated with chronic inflammation. Fig. (3) shows the relationship between molecular damage to plasma proteins and the stage of the disease progression in our patients. This result suggests that COPD evolution corresponds to an increase in protein carbonyls and CRP. The initial or acute oxidative injury to plasma proteins is characterized by an increase in aromatic amino acid hydroxyl groups and the formation of quinones with oxide reduction properties. After what can be considered chronic exposure of proteins to ROS, the amountlevel of protein carbonyl groups increases. Oxidative damage results in altered structure  and function of circulating proteins, leading to altered antigenicity and immune responses, contraction of smooth muscle, impairment of β-adrenoreceptor function, stimulation of airway secretion, and activation of mast cells . Protease inhibitors such as α1-proteinase inhibitor and secretory leukoprotease inhibitor can be inactivated by ROS. These events are considered critical for the protease/anti-protease imbalance that occurs in the pathogenesis of emphysema and correlates with the progression of COPD . Skeletal muscle dysfunction in COPD is characterized by two different, but possibly related phenomena: 1) the net loss of muscle mass and intrinsic muscular phenomena, and 2) the dysfunction or malfunction of the remaining muscle. Muscle malfunction may be secondary to intrinsic muscle alterations and/or oxidative injury of proteins by ROS that the muscle generates. Intrinsic muscle alterations include increased mitochondrial generation of ROS due to electron transport dysfunction  and loss of contractile proteins. Oxidative injury may be due to alterations in the muscle environment (hypoxia, hypercapnia, acidosis and oxidative stress) that result from the abnormalities of pulmonary gas exchange that characterize COPD . The concentration of MDA and activity of MPO were not significantly different between COPD patients and healthy volunteers; this may be due to the variability in the data. Chronic inflammation is shown by increased CRP levels in Fig. (2) and protein injury in Fig. (3). This biomarker of oxidative stress injury is induced in acute processes such as ischemia-reperfusion injury that are accompanied by increased lipoperoxidation. Direct protein carbonylation concomitant with COPD progression under oxidative stress conditions can occur through a variety of reactions. Oxidation of amino acid side chains under oxidative stress conditions causes the formation of oxo acids and aldehydes with the same or one less carbon atom than the parent amino acid (e.g., Val, Lys, Ile) . Alternatively, protein carbonylation can result from an indirect mechanism involving hydroxyl radical-mediated oxidation of lipids. Polyunsaturated acyl chains of phospholipids are highly susceptible to peroxidation and breakdown through non-enzymatic/Hock cleavage to form a variety of lipid-derived aldehydes and ketones . Recent studies suggest that protein carbonylation is more commonly derived from lipid-derived aldehydes than through direct amino acid side chain oxidation . Fig. (4) shows that the plasma from COPD patients contained higher concentrations of substrates that generate reactive aldehydes; these substrates may form adducts with circulating proteins, thus independently increasing protein carbonylation by oxidizing the side chains of amino acids (Fig. 3). Generated products such as malondialdehyde (MDA), acrolein , and 4- hydroxynonenal selectively modify histidine and lysine molecules by Michael addition . With MDA, Schiff base formation and Michael addition appear to be simultaneous, thus cross-linking lysine residues. The formation of adducts between proteins and MDA , utilizing only one of its two carbonyls in the Schiff reaction with the amine groups of proteins, creates new carbonyls under oxidative stress conditions. The absence of significant changes in plasmatic MDA in COPD patients when compared to HV subjects could explain the increased formation of protein adducts shown as carbonyls in the COPD group (Fig. 3). The COPD group also showed increased levels of plasma-susceptible oxidation-lipidic substrates (SLPS), which are fundamentally circulating phospholipids (Fig. 4). In conclusion, these results suggest possible progressive changes in oxidative stress and inflammation resulting from acute characteristics (lipoperoxidation) of chronic oxidative stress. This involves damage to circulating proteins concomitant with intracellular oxidative stress, and the systemic consequences include skeletal muscle dysfunction apparent during the progression of COPD. Finally, we propose that plasma carbonyl concentration and CRP can be considered biomarkers of injury and the inflammatory process. These markers should accompany spirometry for assessment of the decreased respiratory function and molecular injury related to the GOLD stages of COPD progression. An additional longitudinal study that includes more patients and lipid profiles, including total phospholipids, lipoproteins, and apoprotein quantifications, must be carried out to further validate our proposal. Development of biochemical techniques: Yessica D. Torres-Ramos and Ivonne M. Olivares-Corichi. Clinical management of patients: María L. García-Guillen, Development of the protocol: Juan José Hicks. Rabe KF, Hurd S, Anzueto A, et al. Global Initiative for Chronic Obstructive Lung Disease Global strategy for the diagnosis, management, and prevention of chronic obstructive pulmonary disease: GOLD executive summary Am J Respir Crit Care Med 2007; 176: 532-5. Rahman I, Macnee W. Role of oxidants/antioxidants in smoking-induced lung diseases Free Radic Biol Med 1996; 21: 669-81. Yoshida T, Tuder RM. Pathobiology of cigarette smoke-induced chronic obstructive pulmonary disease Physiol Rev 2007; 87: 1047-82. Hicks JJ, Montes-Cortes DH, Cruz-Domínguez MP, et al. Antioxidant decrease reperfusion induced arrhythmias in myocardial infarction with ST-elevation Front Biosci 2007; 12: 2029-37. Olivares-Corichi IM, Ceballos G, Medina-Santillán R, et al. Oxidation by reactive oxygen species (ROS) alters the structure of human insulin-dependent D-glucose-C14 utilization by human adipose tissue Front Biosci 2005; 10: 3127-. Man SF, Connet JE, Anthonisen NR, et al. C-reactive protein and mortality in mild to moderate chronic obstructive disease Thorax 2006; 61: 849-53. Allegra M, Tesoriere L, Livrea MA. Betanin inhibits the myeloperoxidase/nitrite induced oxidation of human low-density lipoproteins Free Radic Res 2007; 41: 335-41. Andelid K, Bake B, Rak S, et al. Myeloperoxidase as a marker of increasing systemic inflammation in smokers without severe airway symptoms Respir Med 2007; 101: 888-95. Bozeman PM, Learn DB, Thomas EL, et al. Assay of the human leukocyte enzymes myeloperoxidase and eosinophil peroxidase J Immunol Methods 1990; 126: 125-33. Bernal A, Méndez JD, Rosado A. A rapid colorimetric assay for dry weight Arch Invest Med 1981; 12: 83-. Amici A, Levine RL, Tsai L, et al. Conversion of amino acids residues in proteins and amino acid homopolymers to carbonyl derivatives by metal catalyzed reactions J Biol Chem 1989; 264: 3341-46. Lowry OH, Rosebrough NJ, Farr AL, et al. Protein measurement with the Folin phenol reagent J Biol Chem 1951; 193: 265-75. Torres-Ramos YD, Sierra-Vargas MP, Olivares-Corichi IM, et al. Marcadores plasmaticos de estrés oxidante en población mexicana sana de 31 a 60 años de edad Rev Inst Nal Enf Res 2006; 19: 206-13. Siafakas NM, Vermeire P, Pride NB, et al. Optimal assessment and management of chronic obstructive pulmonary disease (COPD). The European Respiratory Society Task Force Eur Respir J 1995; 8: 1398-420. Agusti AG, Noguera A, Sauleda J. Systemic effects of chronic obstructive disease Eur Respir J 2003; 21: 347-60. Schols AM, Wouters EF. Nutrition abnormalities and supplementation in chronic obstructive pulmonary disease Clin Chest Med 2000; 21: 753-62. Hopkinson NS, Tennant RC, Dayer MJ, et al. A prospective study of decline in fat free mass and skeletal muscle strength in chronic obstructive disease Respir Res 2007; 13: 8-25. Celli BR, Barnes PJ. Exacerbations of chronic obstructive pulmonary disease Eur Respir J 2007; 29: 1224-38. Macnee W. Oxidants and COPD Curr Drug Targets Inflamm Allergy 2005; 4: 627-41. Ravinovich RA, Bastos R, Ardite E, et al. Mitochondrial dysfunction in COPD patients with low body mass index Eur Respir J 2007; 29: 643-50. Roger T, Deans Shanlin Fu, et al. Biochemistry and pathology of radical-mediated protein oxidation Biochem J 1997; 324: 1-8. Schneider C, Tallman KA, Porter NA, et al. Two distinct pathways of formation of 4-hydroxynonenal. Mechanisms of nonenzymatic transformation of the 9- and 13-hydroperoxides of linoleic acid to 4-hydroxyalkenals J Biol Chem 2001; 276: 20831-8. Yuan Q, Zhu X, Sayre LM. Chemical nature of stochastic generation of protein-based carbonyls: metal-catalyzed oxidation versus modification by products of lipid oxidation Chem Res Toxicol 2007; 20: 129-30. Medina-Navarro R, Duran-Reyes G, Hicks JJ. Identification on acrolein from the ozone oxidation of unsaturated fatty acids Hum Exp Toxicol 1999; 18: 677-82. Grimsrud PA, Xie H, Griffin TJ, et al. Oxidative stress and covalent modification of protein with bioactive aldehydes J Biol Chem 2008; 283: 21837-41. Medina-Navarro R, Guzmán-Grenfell AM, Díaz-Flores M, et al. Formation of an adduct between insulin and the lipoperoxidation product acrolein decreases both the hypoglycemic effect of the hormone in rat and glucose uptake in 3T3 adipocytes Chem Res Toxicol 2007; 20: 1477-81.